6074 Black Falcon's Fortress is a Castle set released in 1986. It contains a small castle of the Black Falcons, two guards, two archers and two knights with horses. This was the second castle of this faction, the first one being 6073 Knight's Castle. In Canada and Australia, this was known as 6074 Eagle Crest Castle. This set was reissued in 2002 as 10039 Black Falcon's Fortress in LEGO's Legends line. The Black Falcon's Fortress has a rectangular layout featuring a gate with a raising and lowering drawbridge at the front, flanked by two towers, and a residence building on the rear wall, making it the first LEGO castle ever that contained a distinguished living area. This residence building featured a half-timbered wall panel, a small integrated tower with hip roof and a small balcony. As its predecessor, the Knight's Castle, the fortress was built on green plate-pieces rather than on flat baseplates. It also utilized hinge-bricks that allowed to open the castle. The catalog page of Black Falcon's Fortress shows off an alternate build of the model. It is smaller, with different features. Similarly to the main build, it contains a living quarters, indicated by the Tudor-style wall panel. On the other side is a small overhang providing shade to resting knights. There is no drawbridge, but the front tower is taller with multiple levels. The set comes with six minifigures. Each minifigure's job is identified by it's helmet. There are two archers, identified by their helmets, Part:3896. Two of the Black Falcons are guardsmen, whose helmets are Part:3844. Lastly, there are two knights. They are both different in plume colour, helmet colour, and body colour, but their helmets are both Part:x167. The Black Falcons fought the Crusaders. The blue flag with the falcon crest was only available in this set. Even the 2002 reissue contained a slightly different piece. This was the first set that included a yellow timber frame wall panel. 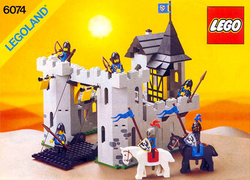 The only other set (beside the rerelease) that contained this element was 6086 Black Knight's Castle from 1992. A red version was included in 6067 Guarded Inn. Facts about "6074 Black Falcon's Fortress"